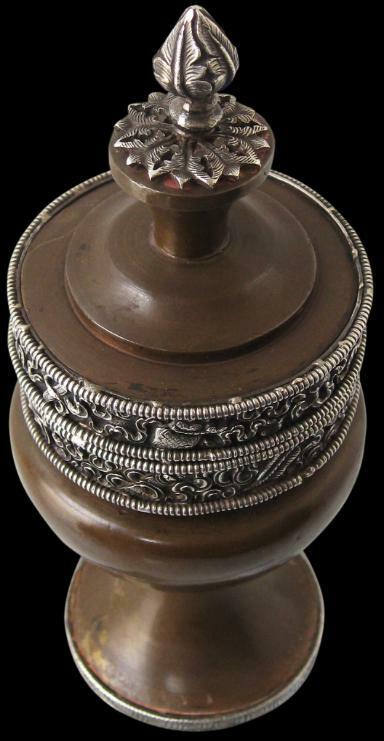 This fine ink bottle made from copper sheet with chased silver mounts is of typical Tibetan form. The vessel has a straight neck, a round globular body and a circular flared foot. 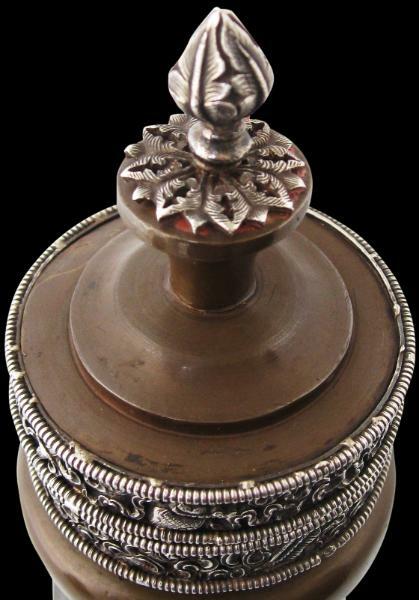 The inverted mushroom shaped cover has a silver lotus-bud finial rising from a chased, open-work flower motif, also in silver. The rim of the cover and the top rim of the bottle are encased in chased silver bands decorated in high relief with Sino-Tibetan symbols amid scrolling ribbon motifs within thick pearled silver wire borders. The rim of the foot similarly has a silver band that is engraved with a key-fret design also within pearled wire borders. The inside of the cover is fitted with a wooden dowel which plugs into the base of the vessel. Such a structure means that even when such bottles are upside down, the ink will not escape. The interior shows ink residue. 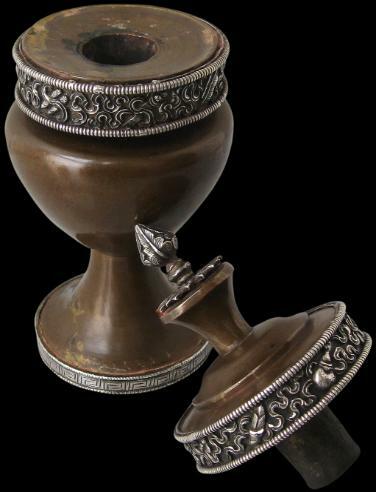 An ink bottle of gold and silver but almost identical form as this example is illustrated in: Shanghai Museum, Treasures from Snow Mountains: Gems of Tibetan Cultural Relics, Shanghai Museum, 2001, page 210.